Every year, the Architectural Engineering department of the Vrije Universiteit Brussel organises an Architecture Week together with the student association bru:tecture. During this week many internal and public events are taking place, organised by researchers and students. This year the general topic is ‘Islands of Brussels’. You can find all information about the events on this website. 3 public lectures and activities are being organised in the context of the Architecture Week of the students of the Vrije Universiteit Brussel. Each of these lectures and activities is linked with the general topic of ‘Islands of Brussels’. Our students will do research on this topic for one week. You will find more information in the sections topic and workshop. We are very pleased to announce the following events. All lectures will take place in the former Barracks of Ixelles. Click on an event for more information. During the workshops, students will work on the topic of ‘Islands of Brussels’. More specifically, they will investigate urban places such as the Warande Park, the Gare Midi, Tour & Taxis, the VUB campus in Etterbeek etc. These are urban islands that are very different from their surroundings according to function, morphology or appearance. The research by the students will explore the relation between the Islands and their environments. Students will investigate the most intrinsic characteristics of the islands and use these as a starting point for utopic, caricatural or dogmatic designs. By this process of ‚research by design‘, we will gain insight into the meaning of such islands in Brussels. 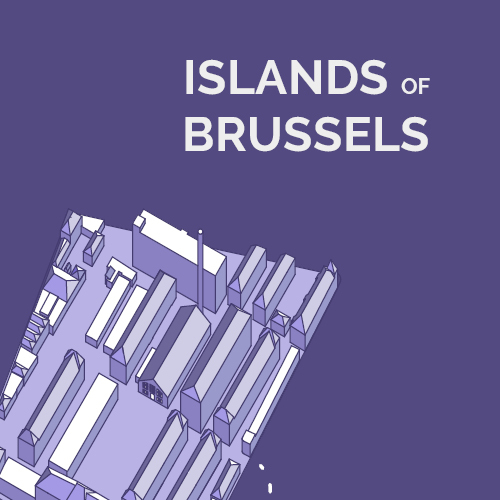 The outcome of the workshops will be a collection of designs that will illustrate the meaning of islands in Brussels, based on plans, sections, perspective drawings or collages. This output will serve as a base for the public panel debate at the end of the week.